"If I die, you die." Edgar Allan Poe's writings have proven notoriously difficult to adapt for the screen, though not for lack of trying. Part of the problem is that most of his notable works are short stories that cannot fill an entire feature's running time. Here three of the greatest European directors try their hands at a Poe anthology. In Metzengerstein by Roger Vadim, the baroness Metzengerstein (Jane Fonda) is notoriously sensual and cruel. She has everyone under her thumb, until she meets her cousin, Wilhelm (Peter Fonda). Shortly thereafter, he is killed in a stable fire, trying to rescue a favorite horse. A tapestry in the baroness' home has a black horse mysteriously burned out of it, and then a black stallion makes its appearance, to her utter fascination. Is it a reincarnation of Wilhelm, or something more sinister? The least literal transcription is, unsurprisingly, that by Fellini. In Toby Dammit (adapted from Never Bet the Devil Your Head), the title character (Terence Stamp) is a dissolute Shakespearean actor brought to Rome by the promise of a new Ferrari to make a Catholic western. Dammit goes from one bizarre experience to another, ending in a lengthy and wild ride through the Roman environs. But Dammit cannot escape the devil, who appears to him in the form of a little girl with a white ball (Marina Yaru). Self-consciously arty, the three tales tend to be fairly heavy going. Vadim plays lengthy dialogue sequences with music only; Malle gets bogged down in the confessional scenes and the card game and doesn't develop the relationship between the doubles in a satisfying manner, and of course Fellini's production is his usual freak show. The picture definitely has its moments, however. William Wilson's debauched attempt to dissect a live woman, as well as his vicious caning of Giuseppina are notable, and the image of the devil in Toby Dammit is utterly chilling in its portrayal of the ultimate wickedness in the guise of innocence. While this is a French-language print, oddly enough the titles are in English (the onscreen title is Tales of Mystery and Imagination). 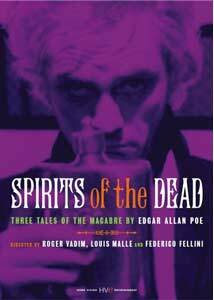 The content seems to be identical to that of the earlier Image disc, with the exception of the titles and the narration over the closing credits of Poe's Spirits of the Dead by Vincent Price, added for the US release by AIP, which is missing here, but was included on the Image disc English language track. That disc, however, was from a PAL master and thus the running time was abbreviated by over four minutes. Image Transfer Review: While the picture here is much improved over that of the Image disc, it's still not very good. Colors are far richer and blacks have more depth to them, but there is still excessive grain throughout and some sequences, such as the airport in Toby Dammit seem somewhat faded, as do the main titles. The print is also in mediocre condition, with plenty of speckles; a lengthy stream of blue spots run down the center of the screen in William Wilson just before Bardot is introduced. Audio Transfer Review: Only a French mono 1.0 track is provided. It has a very substantial amount of hiss that often becomes unpleasant; while the Image disc was not quite so hissy, it also had a more distorted sound, so there is some improvement here. Sadly, there is no English language track on the Home Vision version, so Terence Stamp's fevered performance in Toby Dammit is neutered. We also lose Stamp's feeling of being out of place, surrounded by foreign languages while he speaks only English. The Home Vision disc does, however, maintain the brief recital from Macbeth in English. Jane Fonda did her part in French, so the lack of an English track does not harm Metzengerstein nearly as badly. Extras Review: A useful but brief set of liner notes are provided by the head entertainment writer for The Onion, but beyond that, there are no extras. The menu does thoughtfully allow one to go directly to a particular tale from the first screen rather than wading through several pages. Three great directors take on Edgar Allan Poe with mixed results; this is still not quite the definitive DVD of this picture, though the transfer is a huge improvement over the Image release.